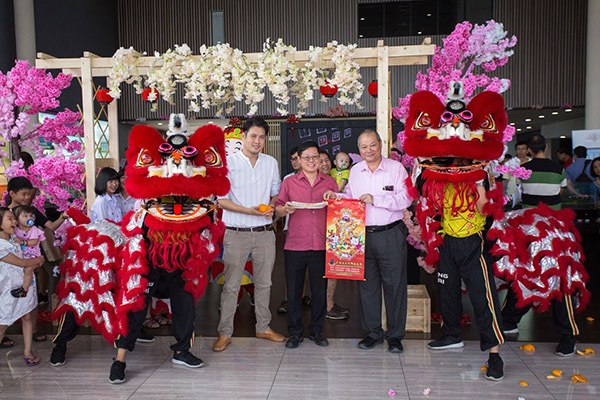 Tropicana Danga Cove Sdn Bhd (TDC) had recently organised its annual Chinese New Year Event at the Tropicana Danga Cove Sales Gallery. The event marks the beginning of a prosperous ‘New Year and New Fortune’ with plenty of fun and activities for everyone. In conjunction with the Year of the Hog, the developer held a lucky draw with a lot of interesting prizes as well as other activities such as the Cherry Blossom Display, Fengshui Sharing Talk, Buffet CNY Feast and a lot of fun family activities. Tropicana Danga Cove (TDC) has launched Phase 1 of Ayera Residences and was opened for registration since July last year. TDC in partnership with Iskandar Waterfront Holdings (IWH) recently opened registration for Phase 2A of Ayera Residences after the successful launch of Phase 1, both being TDC’s first landed project in the southern region of Iskandar Malaysia. Deputy General Manager of TDC, Russell Lim said, after receiving an overwhelming response from the launch of Phase 1 which consists of 179 double-storey terrace houses, TDC is looking forward to a similar scene for Phase 2A. “Each unit has its own pocket garden and is carefully designed to maximise functionality and versatility of space. Homeowners will also get to enjoy a peace of mind living within the guarded neighbourhood”, he added. Russell Lim added, “We are not just celebrating Chinese New Year, but have also formally launched our Phase 2A of Ayera Residences with 172 units of terrace houses. So far, 80% of the units have been sold and we are focusing on selling the other few units left”.